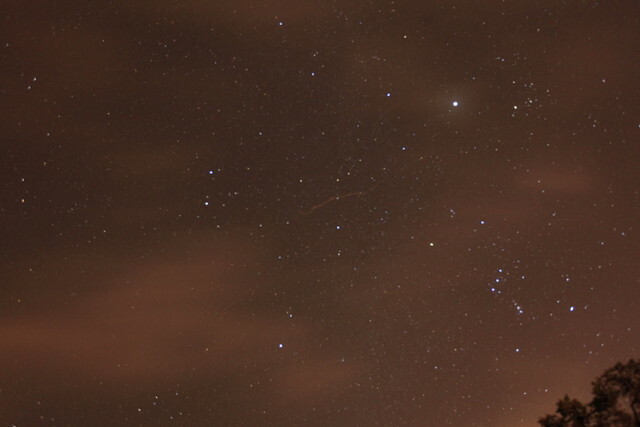 One bleary-eyed meteor hunter bags a prize - a brillliant meteor with a trail that persisted for 13 minutes. 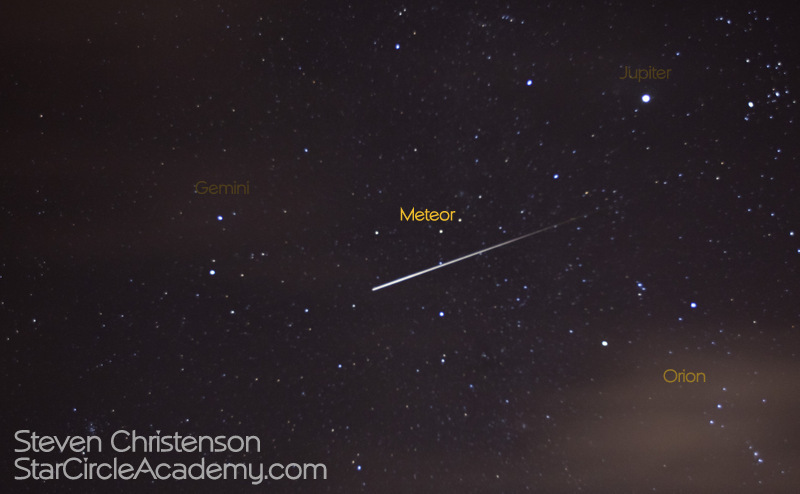 Want some tips on finding dark skies, and catching the Geminid Meteor shower? We have compiled some tips for you here with links to more details. Psst. 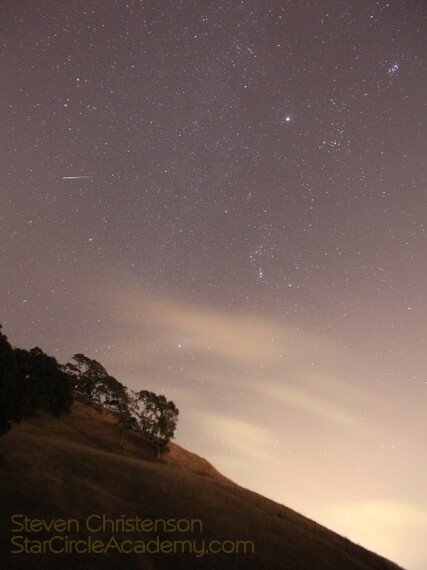 It’s not a secret but we love meteor showers here at StarCircleAcademy.com. 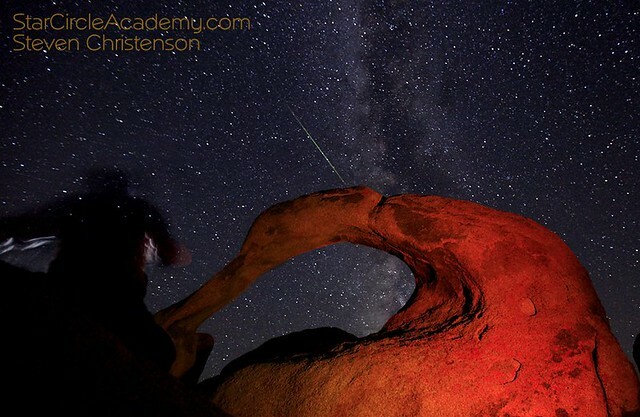 So much so, that we frequently schedule expeditions to capture meteors in interesting dark sky locations. The latest expedition is in a few days. But if you look through our catalog of events, (e.g. the latest and this one) you’ll see we’ve been hunting meteors for quite a long time. 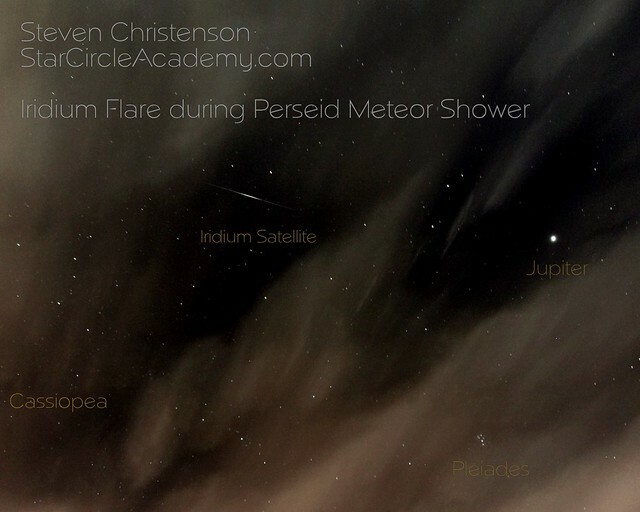 The things you want to happen for a meteor shower include a non-intervening moon. Showers peaking on or near full moons are usually disappointing. Then, of course you’ll will want good weather, and an interesting foreground. However there is no cookie-cutter approach to getting that to all work out. For the Geminid meteor shower, it’s useful to know that Gemini rises in the East a little after sunset and sets in the west around sunrise. If you want to get the MOST meteors, you generally want to shoot after midnight and before dawn (so southwest), and thus southwest is the direction you’ll want the darkest skies. But if spending midnight to dawn somewhere is not practical for you, consider finding dark skies facing the south East instead. Meteors CAN appear anywhere in the sky, however, so even when we suggest dark skies to the south, do not let that stop you from finding dark skies in any direction. The interesting foreground you want may only work with a Northern view. 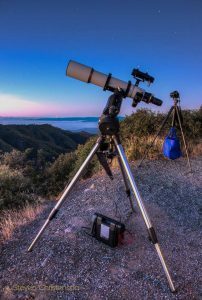 We describe at length how to find dark skies in this article and in the discussion consider alternatives, such as distance, weather, and goals. 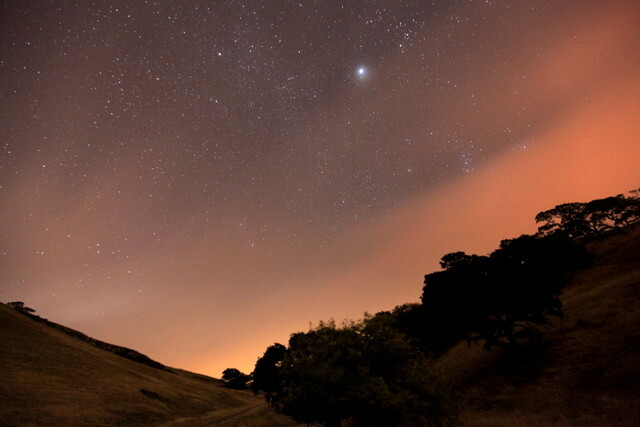 In that article we also link to a resource to help you find dark skies. But do not be mislead: not all dark skies are created equal and there is really no substitute for having been in a location a time or two to know how “dark” is “dark.” Understand that weather conditions significantly affect the darkness of skies. Dry, arid places as a rule will be darker than moister climes. Once you have landed on a place, you need to know how to shoot those meteors – so we have an article for that, too! And once you get those little streakers, you will want to be confident that they really ARE meteors (most of the time they are not). 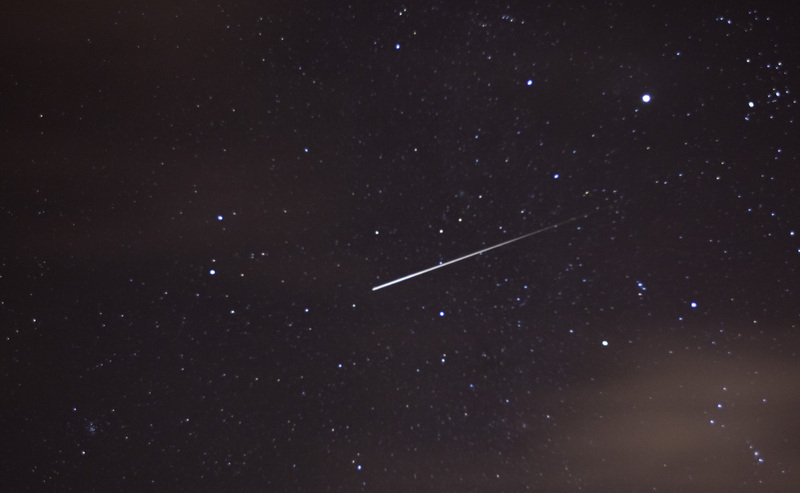 So if you want to know that what you got are indeed meteors, please read our article on identifying those streaks accurately. Dress appropriately. Assume it will be 20 degrees F colder than the stated overnight low. Not because it will be colder, but because with no sun to warm you at all plus little activity it will FEEL colder. Bring a fully reclining chair or sleeping mat so you can lay down and look straight up (or toward the darkest skies). Bring a blanket or sleeping bag and a pillow. Bring some hot (and/or cold) beverages in a thermos and some snacks. 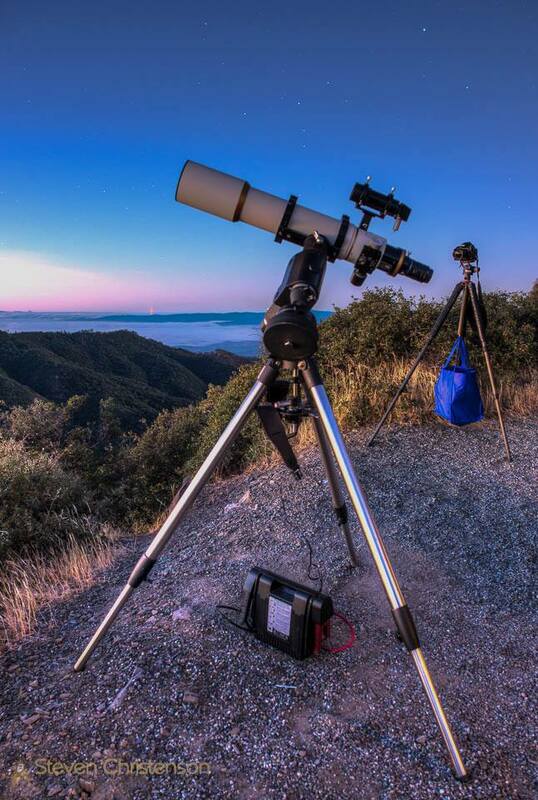 Set up you camera with an equatorial mount to track the skies, or just point it toward the dark. Use an intervalometer to automatically take photos (using the settings we suggested in this article – don’t want to read that: try ISO 6400, maximum aperture, 20 seconds or less). Bring a friend. You will be encouraged to hear your friends going OOOH and AAAAAH when you do – and if nothing else, you can keep each other awake and share stories. Be sure your family knows where you’re going and when you’ll be back (if they aren’t coming with you). 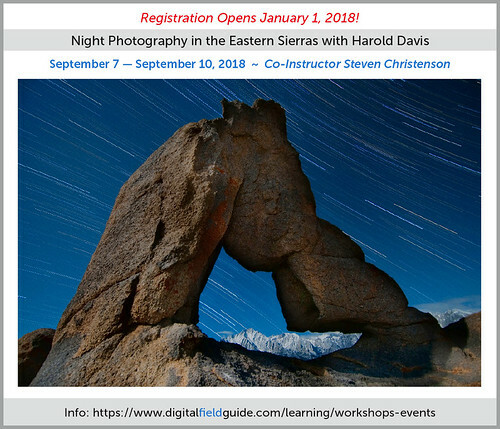 There is always more, of course, but ultimately we suggest that when possible, you consider joining us when we schedule a workshop or field expedition. Happy space debris hunting to you! 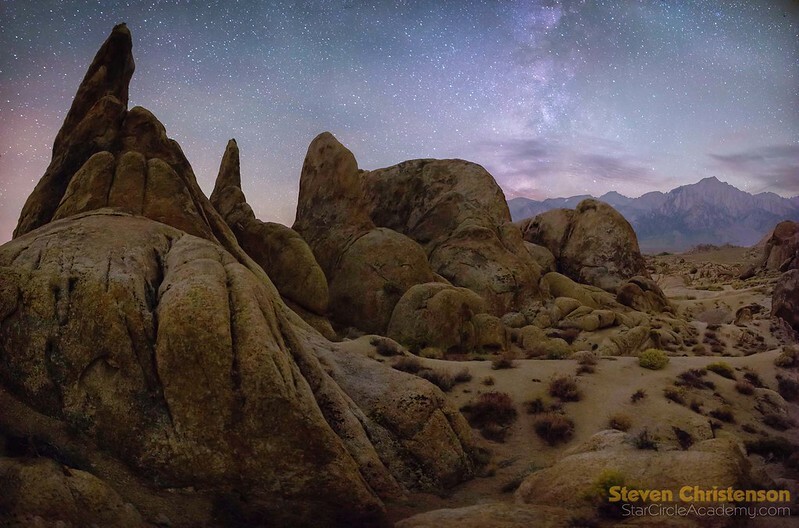 This entry was posted in Astronomical Event, Equatorial Mount, Travel and tagged camera settings, choosing locations, dark, dark skies, Geminids, location, meteors, south, tips on December 10, 2018 by Steven Christenson. If you search around the internet you will find plenty of product reviews. One of the best reviews I ever read said something like this: “Save one thousand dollars by buying the right gear now instead of later”. He proceeded to describe how cheap tripod legs and cheap heads ended up costing more than had he bought the good gear from the beginning. 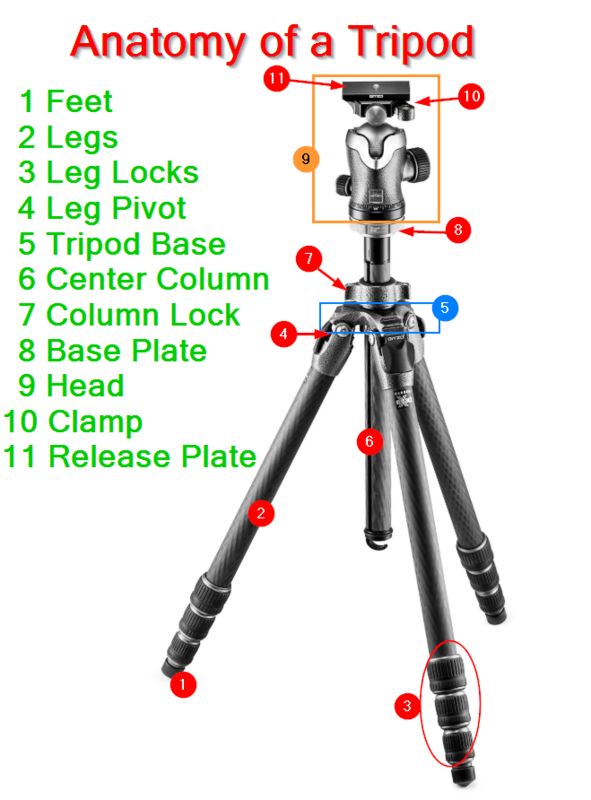 There are four parts to a tripod that are important to get right: legs, head, release, mounting plate. Merry Christmas and Happy Holidays! Harold Davis and I will be conducting a workshop that you may want to attend. Registration is through Harold’s web site. Legs – The part that touches the ground, and yes the bottom of the legs is called the feet. Head – The part that is attached to the top of the legs and provides the ability to rotate and tilt the camera at various angles. Quick Release plate – the part that you attach to the camera and mate to the release system. You can directly screw your camera on to many different heads, but you do not want to do that because it is really, really inconvenient. If any bit of those is wrong, you have an unstable or even equipment-hazardous situation. Trust me, I started with “K-Mart” tripods (had 3 – each of which didn’t last long), 2 Manfrotto aluminum tripods (one is broken), and ONE Gitzo carbon fiber tripod. I have also owned at least 9 different heads including a pan-tilt head, SunFoto, Manfroto, Acratech, and a gaggle of off brands. The ball heads were bought for various purposes. I have also dealt with 3 different kinds of attachment systems: direct screw-in to the camera (really inconvenient), Manfroto style plate clamp (better), and Arca Swiss clamp (best of the bunch). I have also used a gaggle of different “quick release” plates from cheap off-the shelf, to custom made for my camera(s), including L-Brackets. Trust me when I tell you I have discovered a lot of what not to buy, and can say confidently that if you want a stable, good quality camera support system you need to get all four components right. 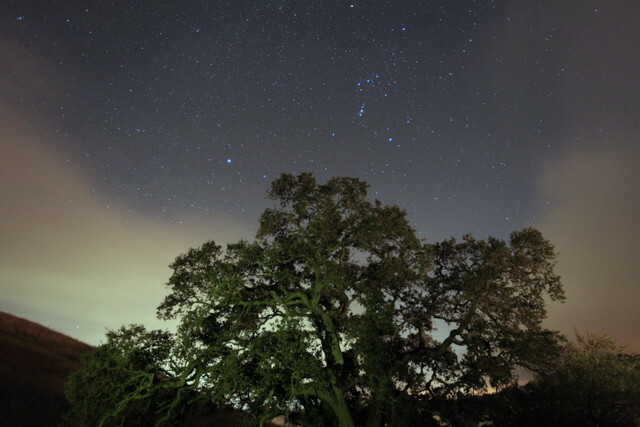 And doubly so for night photography where long exposures REQUIRE a tripod or other solid support system. 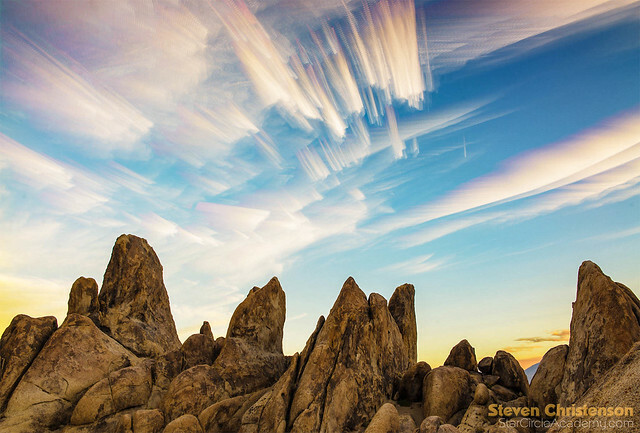 My tripods have been to the top of Half Dome, Mount Whitney and Clouds Rest. I have used the “legs” as a walking stick to keep me from falling into rivers and ravines, to test stability of the ground before taking a step. Let me provide some examples of the myriad of ways things can go wrong: all of them have happened to me, by the way. If the quick release plate is attached with a low quality screw or bolt… the bolt could snap and your camera and lens will tumble to the ground. If the quick release plate is difficult to get a snug fit (or requires a special tool that you do not have with you), your camera will wobble or twist in the breeze no matter how stable everything else is. If the plate is difficult to get into the latch (release clamp), you may think you have it ready to go, only to see your camera fall off the tripod onto the ground or down a granite staircase. If the plate you have on the camera does not mate with the clamp on your tripod… oops. You’ve lugged your equipment for nothing. If everything is solid except the clamp does not snug down well, you have wobble and ruined photos. … and we have not even gotten to the head or the legs yet! If your head requires superhuman strength to keep it from creeping under the weight of your camera and lens (or super human strength to undo it)… you get either painful fingers or a “sinking” camera angle. Even if the leg locks seem to be working well, unusually cold (or hot) weather may render the locks ineffective and your tripod may slowly – or suddenly – fall over. If the legs cannot be adjusted wide-enough or accurately-enough or low-enough, a breeze or strong gust of wind may blow your rig over. If the fully extended legs are so short that you fully extend the center column to keep from hunching over and hurting your back – you have turned your tripod into a wide-stance monopod that may not be able to bear the load. If your center column has a tightening collar or wing nut directly below the weight of your camera, you may accidentally over loosen the column causing the camera to slide down and pinch the living daylights out of your hand. If your legs are spindly, they may induce vibration, or just snap when you accidentally bump them. … I could go on … but I am hoping you understand how hard knocks, broken lenses, and broken tripod components all add up to a severe lack of enthusiasm for all but the best built of components. So here is where you might expect me to make recommendations, right? I usually avoid making recommendations because gear changes, and people have different reasons for choosing what they do. My criteria are pretty simple: I want stability, versatility, durability, and light-weight – in about that order. While the first three seem to be pretty obvious criteria, the light-weight aspect was something I learned over time, too. It was a chore to lug my > 8 pound aluminum leg Manfrotto with a Manfrotto head to the top of Half Dome. By comparison my < 4.5 pound Gitzo plus Acratech head seemed like a feather. Manfrotto made a smart move when they bought Gitzo. You might have noticed that I did not list price as important. It used to be, but too many failed choices made me realize that choices that are less than great become costlier in the long run. In a similar vein I bought half a dozen sleeping bags hoping to get something lightweight and WARM until I finally spent almost $300 on a bag (Big Agnes Lost Ranger) and pad that provided the most comfortable, warm sleep – and was also lightweight. I’ve spent more for a single night in a hotel than for the sleeping bag, but that bag has kept me snoozing on many chilly nights in the wilderness. Indeed one night I had TWO cheap sleeping bags nested inside one another while in a tent in Grandview Campground at 8,600 feet on White Mountain and I was still shivering. The next time I went with my Big Agnes. The night was even colder, but I was snug as a bug in a rug. I had similar experiences with camera backpacks. I liked the design of a Tamron bag. It lasted about a year until the zipper broke. The second bag lasted less than a year. By contrast, my F-stop Tilopa bag has been all over the world over 4 years now – sometimes as my primary and only luggage. To say I’m happy with its durability would be an understatement – and that it cost me 4 times as much as one Tamron bag ($320 vs $95), means I’ve broken even so far – without the inconvenience of dealing with broken gear. What About A Ball Head And Tripod Legs? Acratech Head (pretty much any one), but the GP-s is a nicely designed lightweight capable head unless you have a huge camera. 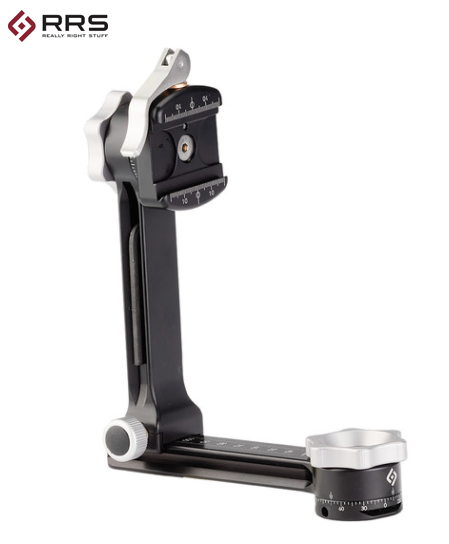 Gitzo carbon fiber legs, but NOT the Traveler series which is too flimsy and too short. I specifically recommend the Mountaineer Series 2. It is the best trade-off between weight, stability and usable height. If you’re willing to pay a penalty in extra pounds, the Systematic series (3, 4, or 5) are good except for two things: The Systematic doesn’t have a center column and sometimes that column is useful – like when trying to shoot straight up since the camera may end up hanging partially below the level of the head. The other thing about a series 5 Systemic that bothered me was that I was shocked to discover that the leg locks must be untightened in a specific order to fold it all up because if an upper leg is not tight, the lock on the lower leg will just spin. The mountaineer doesn’t require that silliness. Really Right Stuff with carbon fiber legs. Pretty much all of them are well done, light and sturdy. The RRS ball heads are good too, it’s just that they are all heavy, heavy, heavy. But, but those are expensive choices! Yes. I suppose paying $430 USD for a good head and $950 USD for good legs sounds like an excessive amount of money. But: how much did your camera and lens cost? How much will your back thank you for carrying a smaller load? And finally, how much are you willing to risk watching your camera and lens flop over in a gust of wind? I write what I know – not what people or manufacturers or merchants ASK me to write. I paid retail price to purchase all the gear I’ve discussed. In other words, these are honest, unbiased, hard won evaluations of various gear. If you can purchase this gear at a local store, I recommend that you do so. You may spend a little more, but there is serious value to talking to real people, testing out gear in person, and in keeping a local business viable. This entry was posted in Gear, Review, Tripod and tagged Acratech, gitzo, head, manfrotto, plate, quick release, really right stuff, RRS, tripod on December 24, 2017 by Steven Christenson. We have many articles on panoramas. The point of this article is to describe the multi-row panorama apparatus I created with off-the-shelf, inexpensive parts from Amazon. The good news is assembly is pretty simple. When you are done you will have a gimbal style mount suitable for taking multi-row panoramas using a modestly sized camera/lens combination. It is important to point out that you need a sturdy tripod and head beneath as the extra top-heaviness will tax a wimpy head or spindly legged tripod. I use the Gitzo mountaineer series tripod – it is lightweight, stable and has served me well for many years. I also have an older (much heavier) aluminum-legged Manfrotto. I have Acratech ball heads on each tripod. Those Acratech heads are really light, and solid. I HIGHLY recommend them. A single row panorama is what you get when you take a series of photos left to right (or right to left) – usually in portrait mode to extend the field of view up to 360 degrees. A vertorama is the same idea, except you usually use landscape mode. In either case, the camera needs to be rotate around the “nodal point” or “no parallax” point. The no parallax point is usually found IN the lens, and is thus never where you attach the camera to a tripod. What is a “Multi-Row” Panorama? Imagine taking a single row panorama, then repointing up (or down) and taking another single row panorama. Now you have a multi-row shot. Here is my parts list all purchased from Amazon. $28.99 Koolehaoda 360° Panoramic Head  This unit was chosen because all the other possibilities had very long lead times. $39.95 Desmond DVC-220 220mm Rail 90° Arca Compatible w Vertical Clamp instead of this 90 degree rail, you can also buy a regular rail (another #3) and a 90 degree clamp. Total is about $125 USD and weighs just under 2 pounds. You can get shorter or longer rails. Might as well get the longer one. While it is heavier, you can use it with a longer lens. If you have an old tripod head, it may have a panning clamp and/or leveling base that you can re-purpose. 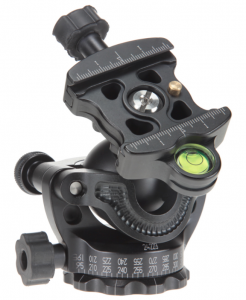 $430.00 Acratech GPs-s Ballhead with Clamp Ball Head with Arca Clamp. This one is not required, but it’s really good and has the advantage of being usable without a leveling base by using it “upside down”. And yes, it is designed to be used that way, notice how the markings are repeated so that they are visible right side up, and up side down. At minimum you will need a bubble level somewhere on the horizontal surface or a means to align the unit perpendicular to the ground. Assembly is straight forward. The only tricky part may be securely mounting the Panoramic clamp to the vertical rail. All the rest go together with the built-on clamps. What If I Do NOT Have My Ball Head Upside Down? If you already have a panning clamp on the top deck of your ball head, level the deck and use the existing panning clamp. 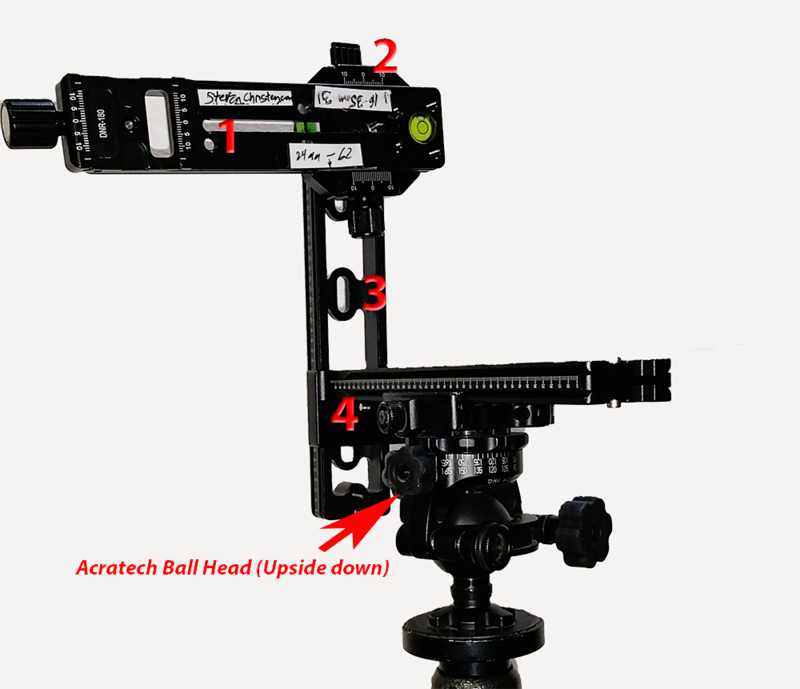 If your ball head has a panning base, you can carefully align the tripod so that the head mount (the deck where your ball head attaches) is level. Then align the clamp so that it is level as well. You can use the panning base of your ball head. Note this is not easy to get right, but a slight misalignment is usually easy to correct in the stitched photos. NOTE: Be sure to check for level-ness through a complete rotation! Our Acratech Nomad ball head, for example, is not designed to be easily mounted upside down, and this method is what we use. Since we have plenty of material on how to do this, we will refer you to our prior articles (see the top of this page). If assembling a multi-row panoramic head from parts is not exciting, there are several pre-built options. While the bottom head (vertical axis) has handy detent stops, the horizontal axis does not. There is no bubble level on the base. I have not used one, but found and played with one in a local camera store, and saw that is also available online. Like the system we laid out above, do not expect this rig to hold up your 20 pound camera/lens combination. Total weight is about 2 pounds and rated capacity about 7 pounds. There are two units. The PG-01 which is similar to what we custom-built above at a price of $285 USD (at B&H). The other option is a beast. 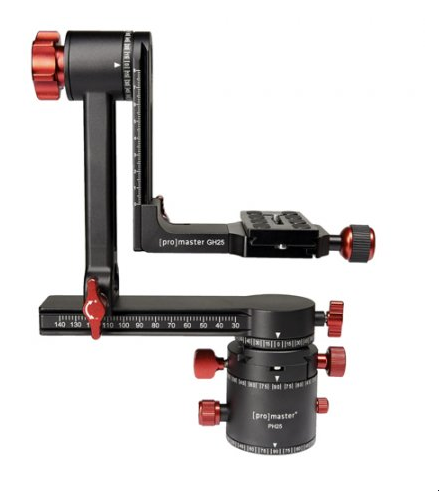 And at $795 USD (from B&H) is not cheap, nor complete. You may still need a leveling base. 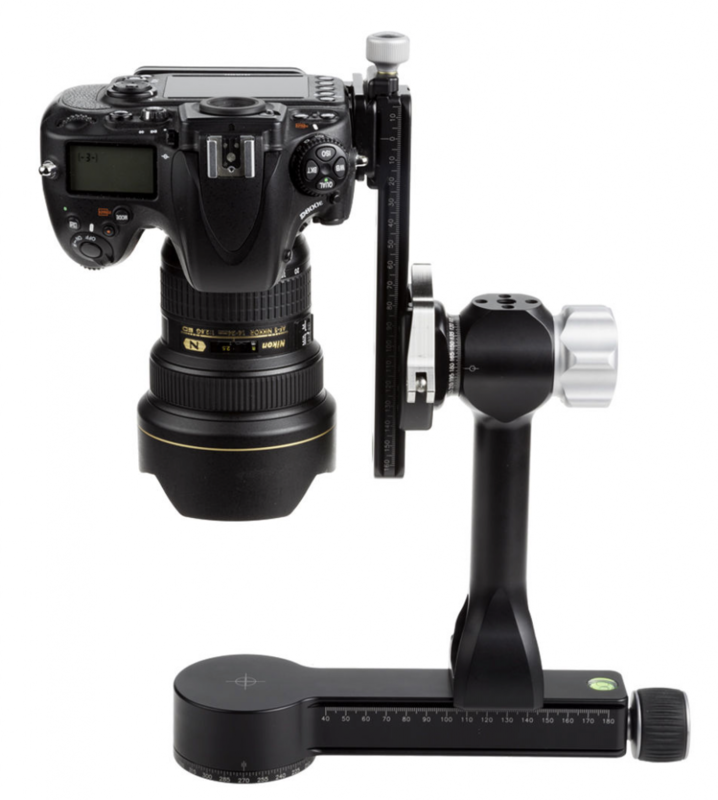 There are many options available, too, including a gimbal cradle. Check out the possible configurations at the Really Right Stuff website (though when we last checked the units were on back-order). You will also need a nodal rail to pair with the above. There are no detent stops for this, and as with others, you’ll need to level your base to use this. (There is also an option that includes a leveling base for about $290). One reviewer reported that he had trouble keeping his moderately heavy camera from slouching down on the vertical arm. There does not appear to be a bubble level on the horizontal bar as there is on the larger model. The version with the built-in leveling base clearly does have a bubble level. There are no detents to set up fixed rotational amounts. Note that the vertical rotational axis clamp is located under where your camera would be and might be inconveniently located.Total weight is about 1.3 pounds with the two pieces plus a nodal rail. As with all Really Right Stuff gear, there is some seriously thoughtful design and overbuilding here. It is beefy with big easy to find knobs, great clamps and little touches like the target on the center of the rotational axis. Why is that a good idea? If you align the bulls-eye target in the center of your image (see our video), you have the correct location for multi-row panoramas (provided the set back is correct). You may still need a leveling base (though might be able to use the bubble level at the right edge). You can replace your current head with this unit and have full mobility, otherwise you’ll need a plate to mount the unit to your ball head. All that great design costs money though: about $795 and up. Weight is about 3.3 pounds. 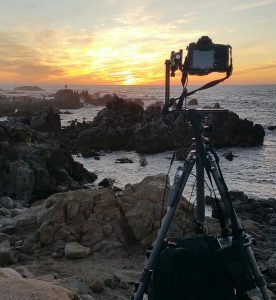 This entry was posted in Gear, Panorama Head, Uncategorized and tagged Acratech, Arca Swiss, ball head, gimbal, home built, leveling base, multi-row, nodal rails, panning clamp, panorama on November 23, 2017 by Steven Christenson.